Each week one or two orders seem to trickle in from random places and this is plenty to keep me busy and entertained. It is kind of exciting that this week's orders are from "return customers" that I don't personally know. 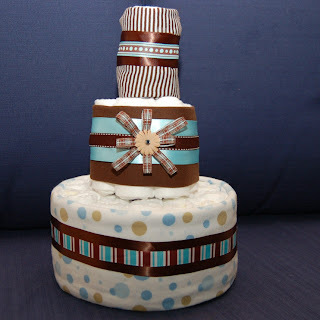 The first is from a gal I made my first diaper cake order for. She emailed me saying a good friend found out she is pregnant and she wanted to send her some gift and wondered if I could come up with something. Well, I love challenges so I took her up on it. She didn't want something for the baby, but instead of the mom. 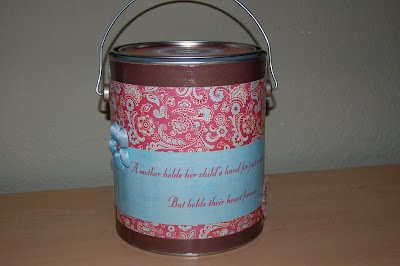 I have been eyeing these "altered paint cans" in scrapbooking magazines and thought this was a good opportunity to try it out so here it is! I am thinking it needs a bit more embellishment but can't quite figure out where to place a little ribbon or something (comments and suggestions welcome). Then it is filled with pampering items like chocolate, body scrub and shea butter lotion, slipper socks, pregnancy book and a rice pack for heating up. I think it is cute and the can would be nice in a nursery to throw all those little odds and ends for baby you have hanging around. I am looking forward to playing around with more paint cans for different looks. Order #2 that I got this week is from CrossboneStudio who did my banners and business cards that I love so much. She ordered a paperdoll set for her daughter a few weeks ago and now ordered 2 more. She gave such a wonderful feedback on my shop I had to share: "THIS IS ABSOLUTELY THE MOST ADORABLE THING!!! I love it! My daughter will love it! Lots of fabulous goodies and such great attention to detail!! !EVERY GIRL NEEDS ONE OF THESE - Even the "big" ones like me!!" And then she went above and beyond and attempted to "promote" the paper dolls on an Etsy forum. It quickly got buried but it was so sweet of her to go to the effort! I am also finishing up a busy box that an acquaintance had requested for her kiddos awhile back with no needed due date, which is a bad thing. I perform best under pressure with a firm deadline! Hoping to get it wrapped up for her this week and delivered to get it crossed off my list. WOW long post, did you make it this far???? If so, thanks for reading and letting me share! Could anything be cuter than this?????? I love this stage where the arms and legs come out of the head. 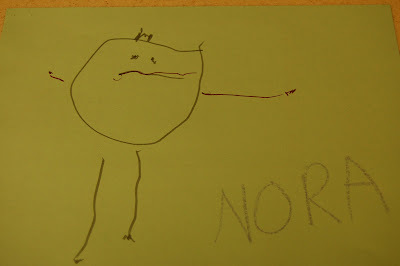 And she even added shoes, fingers and "crazy hair". Check out what my very crafty friend Katy did with her daughter's art on her blog "Sycamore Stirrings". I love the very clear instructions she gave, it makes me ALMOST consider attempting it. But my sewing skills are close to non-existant. HMMMMM maybe Grandma Peggy would like a sewing project!!!! This is a fun gardening project for the kiddos. We did it at home and had such a good time with it the Mom's Day Out program I work with did it for one of their projects too. Lots of moms were very impressed! Start with an empty yogurt container. I found the yoplait ones worked best since they have a narrower top. Cover the container with fabric for "clothes". Fill an old nylon with 1 TB grass seed and then fill with about 1 cup of potting soil. Tie a knot at the end of the soil (don't tie it lower or the dirt will fall down). Fill the cup with some water and let end of nylon hang into it to soak up the water. Add some eyes and spray the top with water, keeping it damp. Eventually the grass will grow for hair (and maybe a mustache and beard!! It is fun to give them haircuts. The girls used their old bottles as nice planters in hopes that if we put flowers out, spring may eventually get the hint and arrive to the Northwest!!! No directions needed, just drill holes in bottom and plant! What to do with all those BPA bottles you don't want to drink out of now? As you may imagine, we have alot of them. 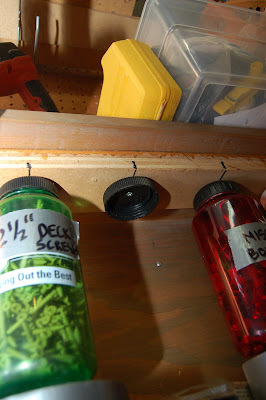 Here is a great solution that Tom came up with to organize materials for his work area in the garage. It could also be great in a craft room. Here's a photo of the lid drilled into the top. Then you just unscrew the bottle and take out what you need. The girls' bottles had different lids so I have a different project planned for those and will post it later this week!!! And this is a great kick-off for me to say HAPPY EARTH DAY!! I have lots of fun projects planned to turn trash into treasure with the girls. Last night I had a wonderful Girls Night Out with 2 friends. 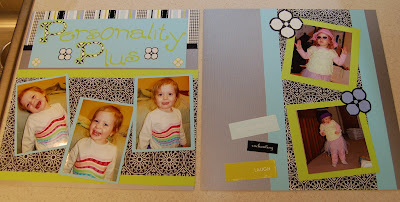 We were getting together to scrapbook, though more chatting than scrapping was accomplished. I did get this one layout comleted in the 7 hours!!!! Next time we will need to be a little more focused. We are going to try hard to get together once a month for scrapping and visiting, which I am greatly looking forward to. And we are giving ourselves a monthly challenge to bring to each get-together. We will all start with the same basic layout idea from a magazine and then do our own spin of it to share with each other. I was studying the layout today trying to get some inspiration. Looking forward to getting started on it. This was a real fun and easy science activity we did over spring break. Connect pipe cleaner into a circle shape and tie on string. Then bend the pipe cleaner into any fun shape you want. Pour boiling water into the jar and stir in Borax, one tablespoon at a time. You will need to add approximately 3-4 TB for each cup of water in the jar. Put pipecleaner shapes into the jar and tie onto a pencil to suspend in the water. Now this is the fun part. We did this right away in the morning after breakfast on a day we were staying home for the entire day. Every hour or so we would check back to see what progress was happening. You could slowly see crystals starting to form on the pipe cleaner and string. We took it out after it had been in overnight and here is our result. It was fun to be "scientists" and look at the crystals with magnifying glasses. We have these hanging in the girls' bedroom windows with the rainbow tube for a pretty art display! 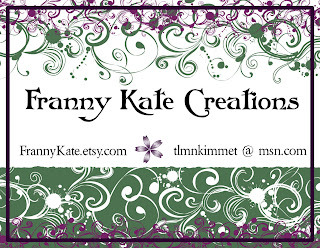 I am thrilled with my new banner for my blog and etsy shop. I had a great time working with Karren from CrossbonesStudio. Check out her studio, she makes wonderful creations. I had such a hard time just choosing one design. Along with the 2 banners and a new avatar, I got business cards and postcards made. I had a fun time working until 1:00 a.m. last night making some new cakes to put on my Etsy shop I have come up with a new style of cake. It is a "petite cake". 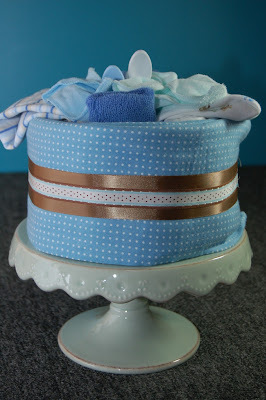 A single layer cake that contains, blanket, 2 onsies, pair of socks, burp cloth, washclothes, spoons, baby lotion and wash. Like the cupcakes, it comes packaged in a nice cake box. I thought they were kind of cute!!! I have this "OH BOY" one and also a "Sugar and Spice" girl one along with a new set of cupcakes. The next creation I want to make is a GO GREEN cake with the diapers that are more environmentally friendly and onsies from organic cotton. For fun I will make it with green blankets and other items!!!! This was one of our science experiments for spring break week. The main concept is showing how different liquids are heavier/lighter than others and will create layers. STEP ONE Give the child cups and pour liquids into each cup. Then choose a different food coloring for each liquid and add sequins or glitter. This is especially good in the thick karo syrup. What we learned - you may want to skip the food coloring for the oil since it affirmed the concept that other liquids won't mix with oil!!! WAHOO! I have hit the jackpot and gotten 2 different sales on my etsy site from random people. One was for this diaper cake Not quite sure how I am going to ship this yet, need to start searching for a suitable box. From now I don't plan to list these tiered cakes since the shipping will be complicated, though I would love to do local orders. I am hoping to get 3 sets of BABYcakes made this week to get listed. My second order was a special order for 3 sets of paperdolls. I have been a bit annoyed with the packaging of these. Fine for handing off to a friend, but didn't really seem sellable. I found these great little boxes from Oriental Trading that fit the individual bags perfectly so now have them packaged like this. The ribbon could use some work (I was bound and determined to get these 100% complete last night at 1:00 a.m.) but you get the idea! I am hoping to relist the paper dolls with these new photos also this week. It is no secret that we love to read and I love to see links to books on other people's blogs so I thought I should add my own. This is the current selection of what our family has been reading. M is devouring the Weather Fairy series. She brought one home from the library yesterday afternoon and promptly went to her room and didn't come out until she was done reading it. At the same time T was finishing up his current read "Three Cups of Tea". N is pretty happy with anything and doesn't seem to have a current favorite but seemed to enjoy this squirrel book from the library. As long as you are reading she is satisfied, though I am sure she would appreciate any flamingo book recommendations you could provide since she is a bit obsessed as of late. ME???? I wish I could say that I have been reading some deep and meaningful novels, but NOPE that isn't happening lately. My head has been buried in the Super Science book as of late coming up with some fun activities to keep us entertained over spring break (stay tuned for photos and directions of some of our favorites!) And I have enjoyed the Sister Grimm series but need to find time to move on past the second. I find anymore that juvenille literature suits me better since they are a quicker read, yet you can still find some great story lines. Plus, I find it difficult to make my way over to the adult world of the library and I can usually navigate myself to grab one of the highlighted books in the sections for the older kids as M searches for as many Magic School Bus books that she can torture me with for this week. Well, this post has been in the works for 3 weeks now since I had my WONDERFUL, AMAZING, RELAXING weekend away to the Keepsake Cottage in Kent. The place was really nice. Just a little house built specifically for scrappers with a huge workroom, cute little bedrooms, tools to use and ALL meals provided. I had brought along extra snacks to share and the owner provided so much food I didn't even break into my stash!!!! Though I did open up the wine I had brought! 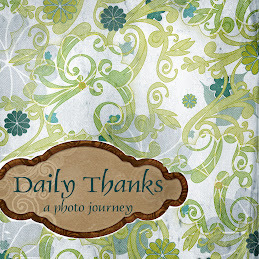 It was so nice to have 3 full days to focus on just scrapbooking without worrying about anything else that needed to be done. And a big bonus was getting to chat with friends and make some new friends as well!!! We will definitely be going back for more of these retreats. I was really pleased with the layouts I did. I tried to do something new that I hadn't tried before on each page (hand stitching and assymetrical pages being my favorites!). I have found as my scrapping evolves, the quality improves greatly but the quantity has taken a drastic cut. I worked CONSTANTLY the entire weekend, up until 2:00 or later both nights/mornings and I only got 12 layouts done. But I am truely in love with most, though I have a little tweeking to on a few where I tried some things that didn't quite turn out to my liking. Thanks for taking a look at some of my favorites. It was really hard choosing one or two to showcase, so I just picked ALOT!!! I recommend clicking on some of the photos to see the detail better in a larger picture! Photos don't do lots of the details justice but you get the idea!!! M had to have one of her top front teeth pulled today. She seems to have the inability to lose teeth in the normal, happy childlike way. At 11 months old she knocked out one of her bottom front teeth on the coffee table and now this. The tooth removed today had been knocked in a fall over a year ago. But just recently it has been starting to discolor more and she has complained of discomfort. The dentist felt it was best to remove it before it did cosmetic damage to the permanenet tooth. So out it came. She is enjoying the role of sick patient and was especially looking forward to having lunch in bed. Though it was obvious she was not feeling well when she requested I only read 2 books instead of the usual 3 after lunch and fell right asleep. Hoping she wakes up a bit more chipper.